How do children cope with challenging situations outdoors? With a bit of imagination and encouragement, they pull through. And they definitely come out more resilient for it. 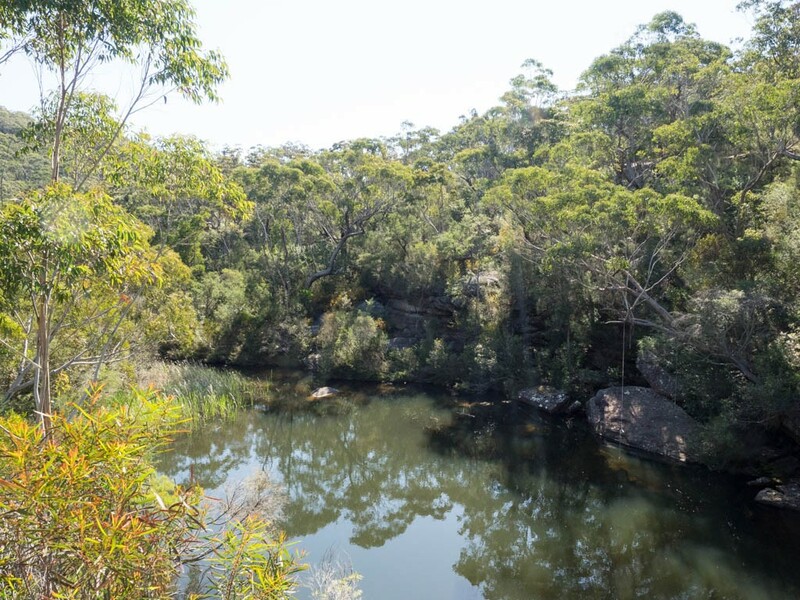 Kingfisher Pool in Heathcote National Park is fast becoming my favourite short walk in the Sydney region: a 3.2km walk down and back up a rough bush track, with an amazing natural pool to boot. It’s easy to get to and has turned out to be a test piece for young children exploring their limits in the great outdoors. Jane, Marilla and I picked up our friend Sarah, her mother-in-law Lenore, and daughters Billie (6, like Marilla) and Emerald (almost 3). It was an unusually stifling Spring morning – the temperature was due to hit the low 30s and it was only October. We pulled up in Heathcote a bit before 10am and were on our way. 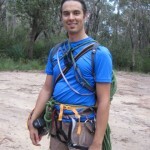 The descent to the Heathcote Creek valley was a breeze, helped by a luxurious morning tea stop. Billie and Marilla forged ahead, happily engrossed in the pleasure of their own company, and the rocks, abundant flowers (more pea flowers than I’ve ever seen!) 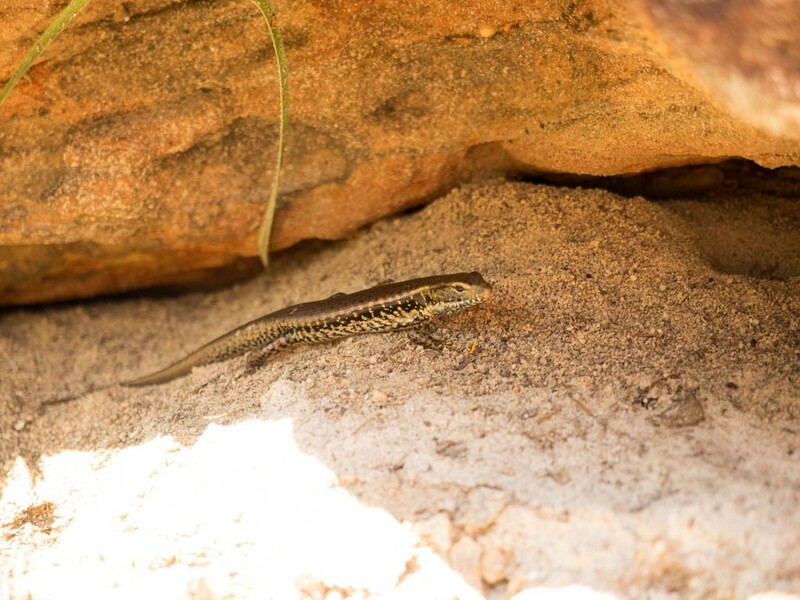 and occasional bird or skink. As we got to the sandy path at the bottom of the hill, Emerald was tiring so I carried her for a couple of hundred metres (Sarah was recovering from a cycling accident). Once we caught up with her big sister and Marilla, she happily tottered after them. 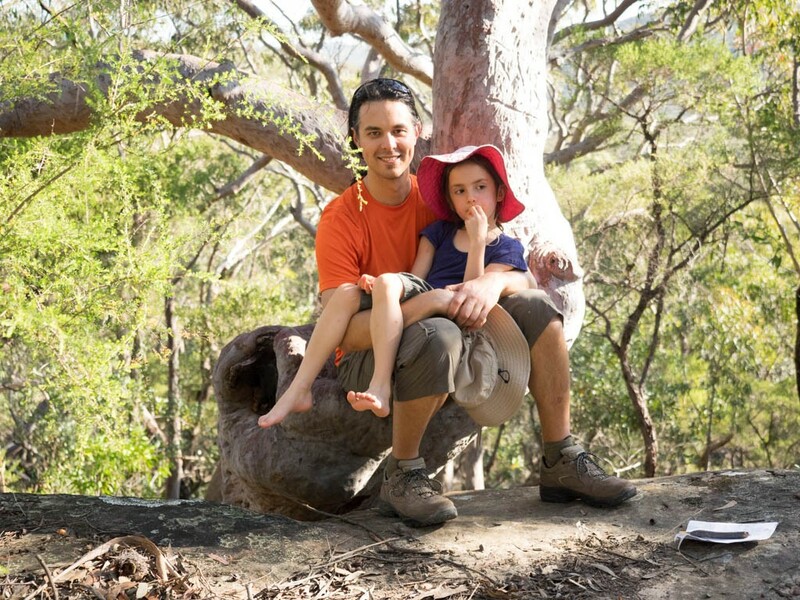 Let it be stated for the record: she’s a champion bushwalker in the making! 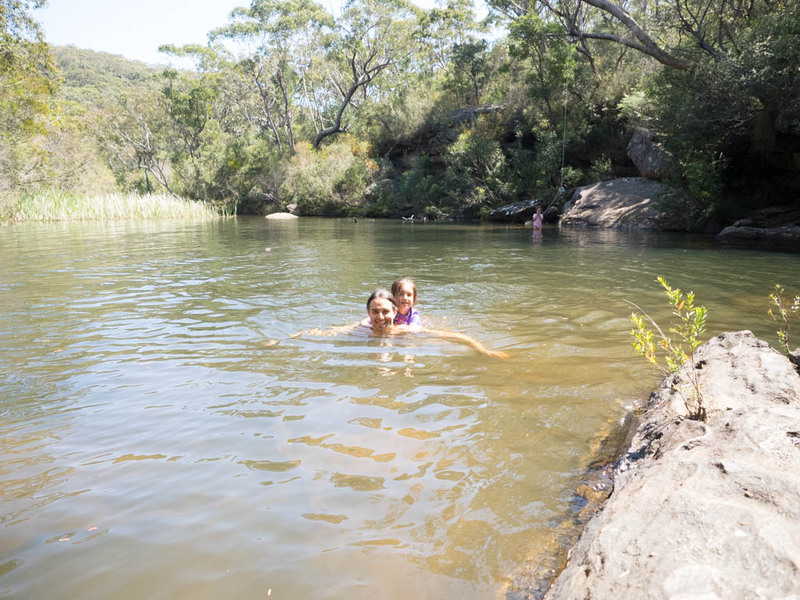 Kingfisher Pool is a beautiful swimming hole surrounding on one side by bush and a rock ampitheatre on the other. 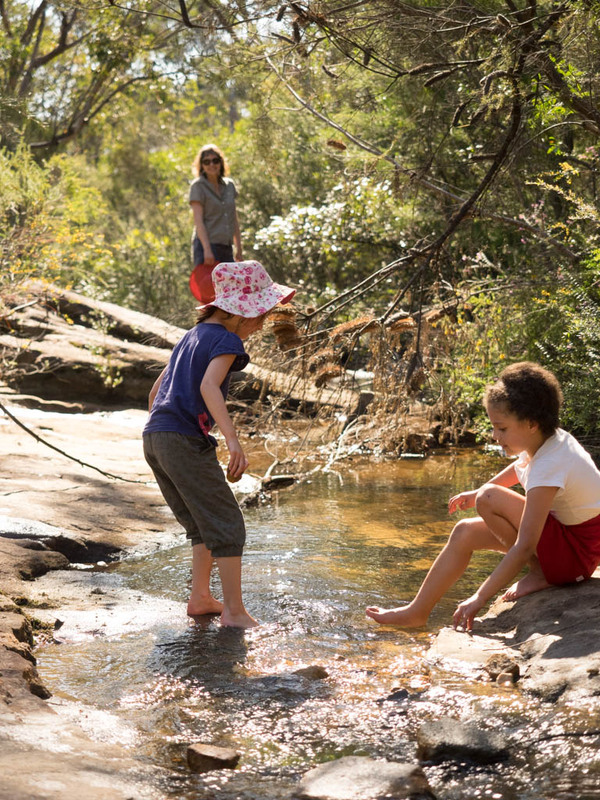 Heathcote Creek flows over a rock slab and into the pool as a small waterfall. Marilla eagerly jumped on my back and we swam out to a submerged boulder on the other side of the pool. I left her there, holding onto a swinging rope that hung from a tree branch while I swam back for Billie. Billie, however, was less sure about swimming out into the (relatively) deep unknown with me. It took a bit of convincing but in the end she gripped my neck tightly (too tightly at times!) and we joined Marilla on the boulder. By the time I swam back with her, Billie had a huge smile – she had taken a small plunge into the unknown and loved it. It’s the sort of experience you can’t get in a chlorinated swimming pool. Emerald was happy to swim out with me too. I was pleased: gaining a child’s trust when fear is involved is no small thing. 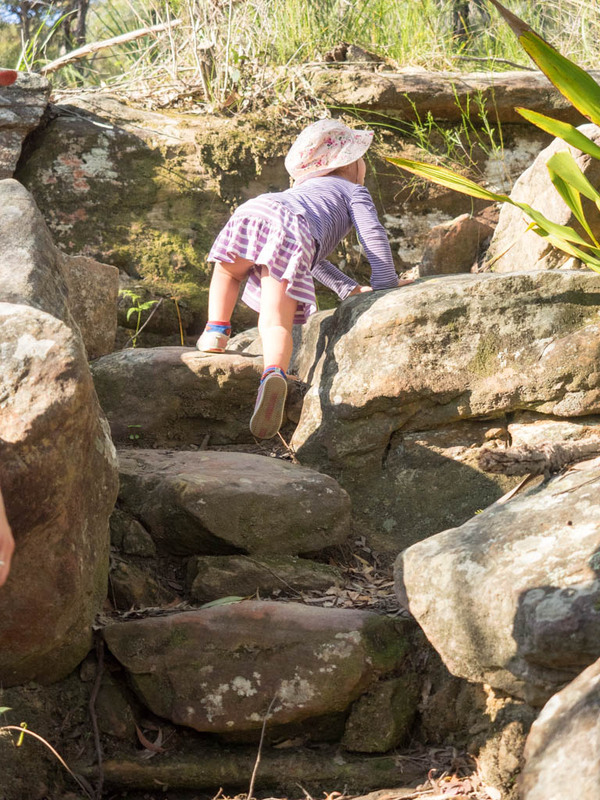 By far the toughest part of any walk with children is the walk out, especially when there’s a hill climb involved – in this case about 100m, which is hardly the Himalayas. To be fair, it was 30+ degrees. The biggest mistake you can make in these situations, however, is to believe that tired legs are the only challenge. In fact, imagination is key. 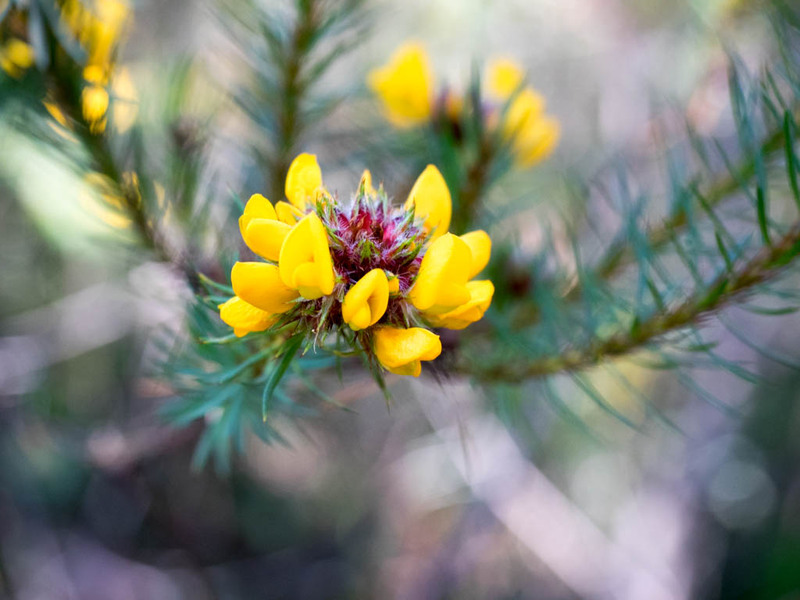 Jane and I had prepared for this, with some treasure hunt sheets for Marilla and Billie (‘Find a yellow flower’, ‘Rub a pencil over some smooth bark’, etc). The sheets were a hit but only got us to the bottom of the hill. Both big girls were already tired of the walk, complaining and groaning with every step. Meanwhile, I’d put Emerald on my shoulders (OK sometimes tired legs are the only challenge, but mainly in toddlers). 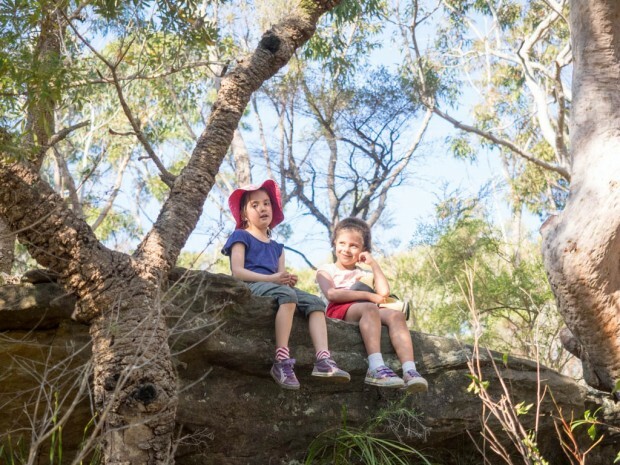 I tried a trick I’d read about on the Bushwalking Blog: pretending dinosaurs were chasing us. ‘That’s silly, Daddy,’ Marilla retorted. ‘Dinosaurs are extinct.’ Fair enough. I resorted to a time-tested trick: interactive story telling, where the kids help to create an imaginary world. Soon both had forgotten all about the heat and even kept the story going without me (it was about a magical fairy tree surrounded by a moat where merfolk lived, in case you were wondering). Sarah was impressed. Even I was amazed when the story became self-sustaining, both girls wandering ahead and spinning the tale on their own. A short while later we crossed a fire trail, the halfway point of our ascent. Now tired legs were becoming more and more of a factor. And with an important mission, both Billie and Marilla skipped up the steep hillside. After a while, Emerald got back on the ground too and clambered after them. Before we knew it, they were back on the ridgetop, staring down at us proudly from a flat rock – the same one where we had had morning tea. They had finished the climb without even noticing it! I was just as proud: sure, they hadn’t conquered Everest but they had confronted their own demons (boredom, exhaustion, heat) and come out on top, quite literally. The walk to Kingfisher Pool was a short one. But it goes to show just how perfectly nature can put our resilience to the test, no matter how big or small we happen to be.